by Beth Knight, first year student, MPhil Textile Conservation. The South Asian Art galleries will soon be reopened after a massive redisplay campaign. 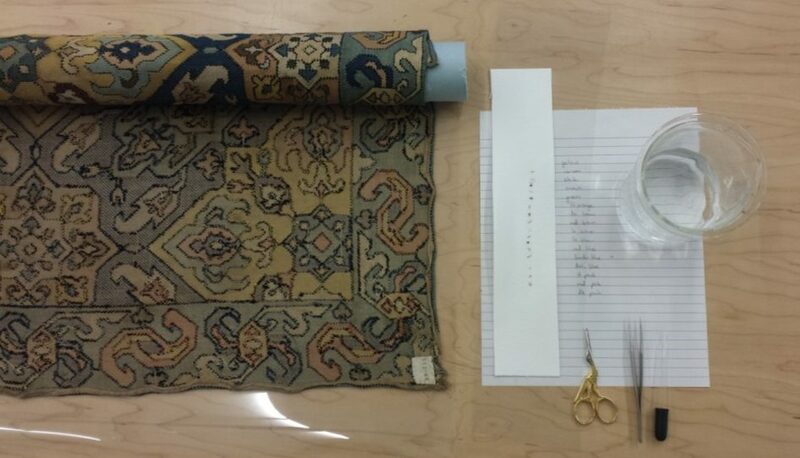 As part of this project, I treated a finely embroidered 19th century Persian cover. 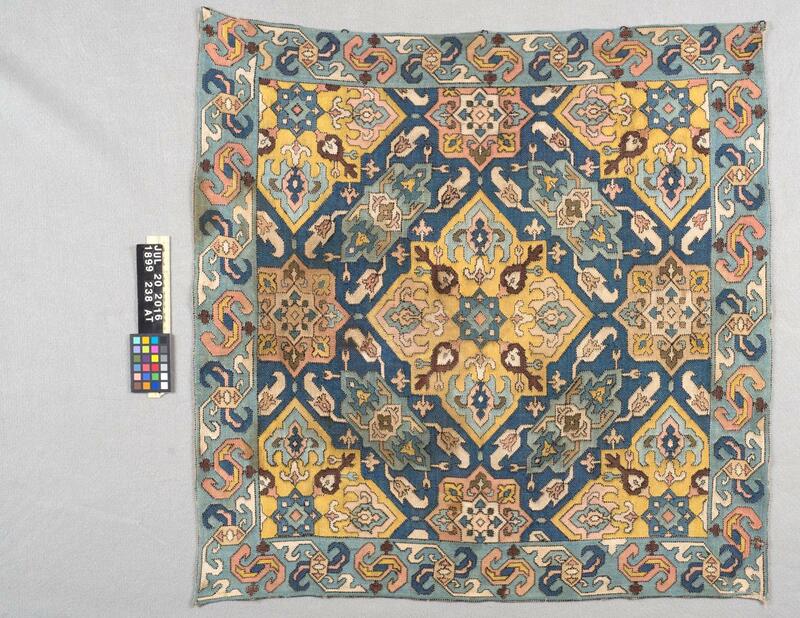 The vibrant textile was muted by extensive soiling and rigid stains. Initial tests showed that the stains and soiling were water soluble, but some of the darker embroidery floss dyes would bleed if the cover was submerged in a wash bath for too long. We had to find a solution that would effectively remove the soiling with minimal rinsing. The 17 embroidery floss colours had to be tested for their washfastness. This challenge reminded me of a sampler I had wet cleaned at the Centre for Textile Conservation (CTC) this spring that also had fugitive embroidery flosses. For that treatment I had experimented with chelators, which can effectively bind and remove soiling, requiring much less rinsing than detergents. They were unsuitable for my previous project, but with Sara’s guidance, we found a buffered EDTA (ethylenediamine-tetraacetic disodium salt) solution that removed the soiling and decreased the time needed for wet cleaning. 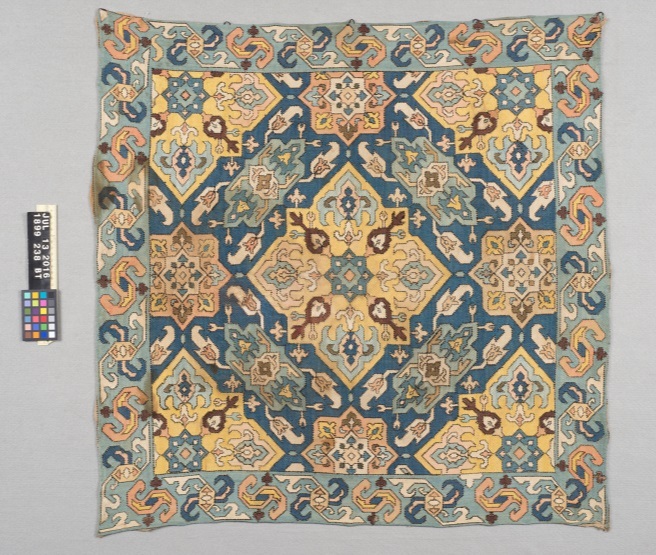 The treatment was incredibly effective – the cover quickly released dark yellow soiling that smelled distinctly of tobacco smoke, likely the legacy of its previous life as a wall hanging. The embroidery was noticeably lighter and the dark stains were greatly reduced. I was pleased with the results of the treatment and overall, the project was a satisfying way to build off of my coursework at the CTC. The dark yellow soiling was very obvious from the moment that we placed the cover in the bath. 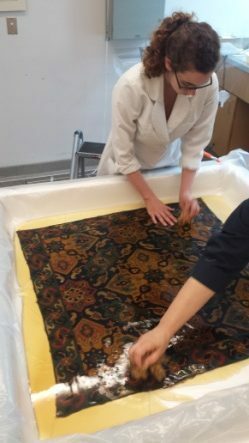 Conservation work continues even after an object leaves the lab for the galleries. The many gallery rotations have given me ample opportunities to work alongside curators and art handlers to deinstall and install textiles from many departments such as American Art, Modern Art, and the costume and textile permanent gallery in the Main Building. 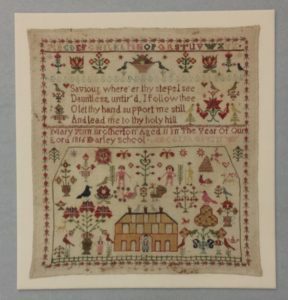 During the spring term, we had learned how to stitch textiles to mounts, which I got to put into practice on a sampler currently displayed as part of the Without a Stitch: Adam and Eve in Samplers (the individual objects on display can be seen via the link). As much as conservators attempt to mitigate dust, objects must still be surface cleaned after they are deinstalled to remove particulates that can catalyse degradation. 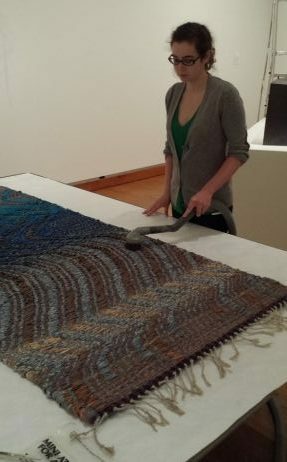 Surface cleaning is among the first skills that we learn at the CTC, and in addition to its preservation benefits, it is always a treat to more closely examine the objects that were on display, especially contemporary art pieces such as the Ted Hallman weavings. 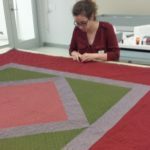 Personally, I love working with large objects, so I was thrilled when Sara asked me to prepare a two meter wide early 20th-century Amish quilt for display in the Museum’s Pennsylvania German gallery. The quilt appeared quite square while laying flat on the table, but after testing it on the hoist in the lab, I quickly realised that its many layers had become distorted from previous vertical display. 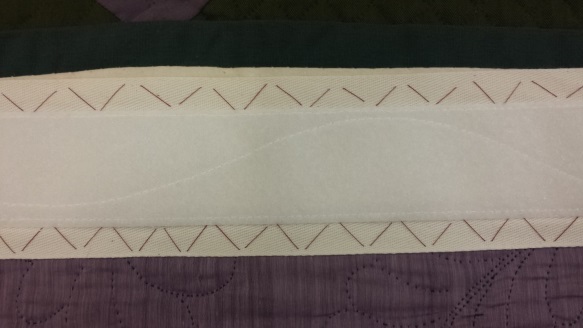 By carefully adjusting the placement of the Velcro® used to mount the quilt, I was able to secure it along its width to the wall mount while mitigating the rippling distortions so that it was supported and the fine quilting can be fully appreciated. A simple strip of Velcro® and twill tape can support this large quilt. 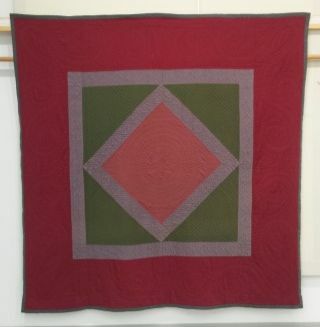 The quilt hangs in the lab. As I reflect back on this summer, I cannot believe how much we have accomplished in such a short time. I am incredibly grateful to Sara, Bernice, Martina Ferrari, Mellon Post-graduate fellow , and Lisa Stockebrand, Conservation Technician, for sharing their experience and time with me. I will depart the PMA having a greater understanding of how a large museum functions in the United States and with new skills to use and develop in my second year at the CTC. I am excited to return to Glasgow to share my experiences and hear about my classmates’ placements.